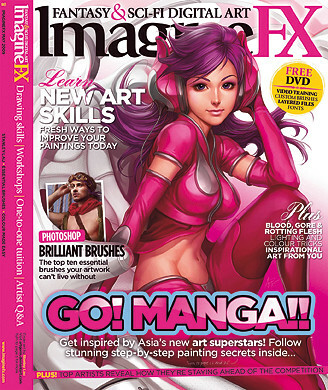 The May issue of ImagineFX has hit the stands around the world in all its resplendent manga glory. This month we’re getting inspired by Asia’s new manga superstars. We’ve got an interview with cover artist Stanley Lau about his art, the Pepper Project and life in general, and a workshop with Chester Ocampo on how to create a manga-inspired, special effects-laden character. We also talk to Trevor Claxton on how to use colour to maximum effect, Lucasfilm’s Jerome Moo takes us through a beautifully rendered aquatic scene, Ioan Dumitrescu shares his approach to lighting a sci-fi cityscape at night and we speak to the ever-ebullient concept artist Izzy Medrano. Plus there’s a load of manga-oriented resources on the DVD, and the first instalment of Charles Bernard’s 12-hour series based on studies of famous fantasy art legends. It's an awesome issue this month, thoroughly recommended. Ahh, I'm so excited, I'll definitely have to pick it up this month. I'll only get that issue in stands on June I think. Perhaps I should subscribe, it's like R155 per issue here or 14euros if I had to convert it. been waiting for 2 weeks! I'm in this issue sort of. I asked Dave Kendel the rotting flesh and mixed media questions which he then rewarded me for by mentioning in my name in the article. Oh god, is my subscription expired??? I never got a notification but wouldn't I have this issue already if it didn't? Asia, of course means Singapore. Anime/Manga style artist looking to do concept designs,character designs,manga,etc..
By askia in forum Artists Available for Work!